You know what happens when I go to lunch and there happens to be a book fair in the lobby? I end up buying a book of course! 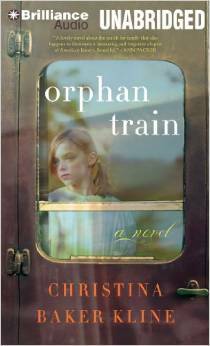 It’s a book that I’ve looked at several times and never got around to purchasing, but I finally went ahead and purchased Orphan Train by Christina Baker Kline. “Between 1854 and 1929, so-called orphan trains ran regularly from the cities of the East Coast to the farmlands of the Midwest, carrying thousands of abandoned children whose fates would be determined by pure luck. Would they be adopted by a kind and loving family, or would they face a childhood and adolescence of hard labor and servitude? That’s what happens to me too! I can’t go into a book shop without walking away with at least one book!